Born about 100 B.C. ; died 47 B.C. He was the eldest son of Aristobulus II. and son-in-law of Hyrcanus. 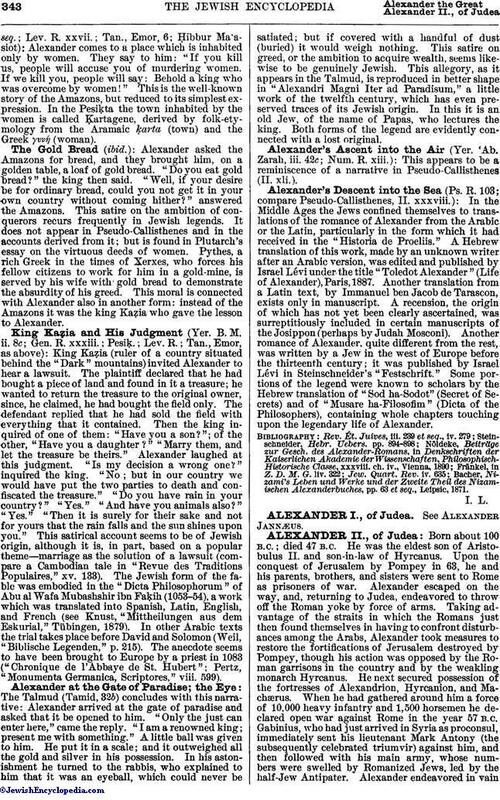 Upon the conquest of Jerusalem by Pompey in 63, he and his parents, brothers, and sisters were sent to Rome as prisoners of war. Alexander escaped on the way, and, returning to Judea, endeavored to throw off the Roman yoke by force of arms. Taking advantage of the straits in which the Romans just then found themselves in having to confront disturbances among the Arabs, Alexander took measures to restore the fortifications of Jerusalem destroyed by Pompey, though his action was opposed by the Roman garrisons in the country and by the weakling monarch Hyrcanus. He next secured possession of the fortresses of Alexandrion, Hyrcanion, and Machærus. When he had gathered around him a force of 10,000 heavy infantry and 1,500 horsemen he declared open war against Rome in the year 57 B.C. Gabinius, who had just arrived in Syria as proconsul, immediately sent his lieutenant Mark Antony (the subsequently celebrated triumvir) against him, and then followed with his main army, whose numbers were swelled by Romanized Jews, led by the half-Jew Antipater. Alexander endeavored in vainto avoid a pitched battle. Near Jerusalem 3,000 of his followers died upon the field, while as many again were made captives, and he with a small remnant escaped to the fortress of Alexandrion. Although promised full pardon, he rejected Gabinius' summons to surrender; and only after a brave defense against the united efforts of Gabinius and Mark Antony did he capitulate upon condition of retaining his liberty. This result of his futile resistance to the Romans was followed by no further personal suffering for him; but it was different with the Jewish people. Even the nominal independence which Judea had hitherto enjoyed under its quasi-kings was now at an end; Gabinius deprived Hyrcanus of all political standing, and left him only the charge of the Temple. Thus the struggle of the brave Maccabees ended in the total loss of even the semblance of independence. Alexander, however, had not yet given up all hope, and in the year 55, after the escape of his father and his brother Antigonus from Roman captivity (56), he again meditated opposition to the Romans. While Gabinius was temporarily absent from Palestine, Alexander gathered around him a considerable force, with which he vanquished such Roman detachments as opposed themselves to him, and compelled the enemy to withdraw to Mount Gerizim. Gabinius hastened back to Palestine from Alexandria, and upon his arrival fortune once more deserted Alexander. A considerable proportion of his force was detached from allegiance by the craftiness of Antipater, leaving him with only 30,000 men, who were unable to withstand Gabinius' attack, and fled from the battle-field of Itabyrium, leaving one-third of their number dead on the field. 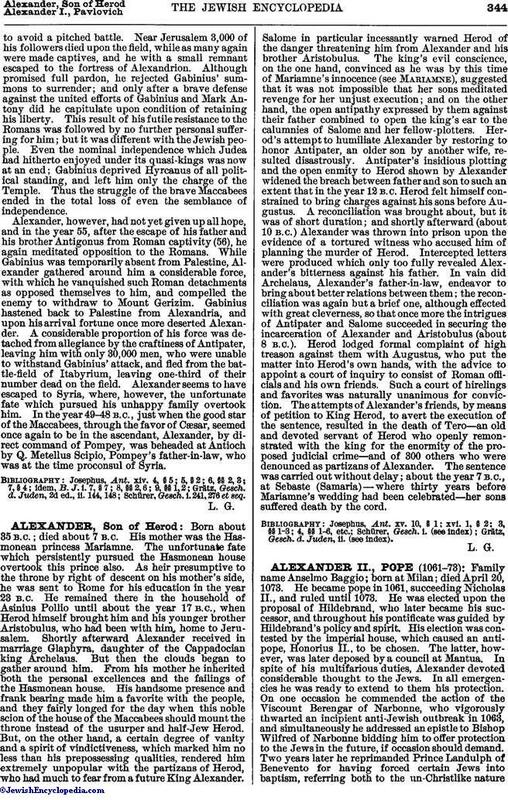 Alexander seems to have escaped to Syria, where, however, the unfortunate fate which pursued his unhappy family overtook him. In the year 49-48 B.C., just when the good star of the Maccabees, through the favor of Cæsar, seemed once again to be in the ascendant, Alexander, by direct command of Pompey, was beheaded at Antioch by Q. Metellus Scipio, Pompey's father-in-law, who was at the time proconsul of Syria. Schürer, Gesch. i. 241, 276 et seq.